What America Really Needs: Less Debating, More Civility. In necessariis unitas, in dubiis libertas, in omnibus caritas…Unity in necessary things; liberty in doubtful things; charity in all things." Before you ask me, the answer is “no”. I won’t watch any of the Presidential debates this year. Unlike the 100 million or more of my fellow Americans who are estimated to have viewed the first of these partisan slugfests, I stuck with “Star Trek: The Next Generation”, one of my all time favorite TV shows. For one night Captain Picard was my candidate of choice. It’s not for lack of interest. I’m not civically disengaging. I’ve probably read more and talked with others more and thought more and written more about this election, than any other Presidential competition in my lifetime. I’m a news junkie. Normally I’d eat this stuff up and yet, I pass for one simple reason. Civility, and the lack thereof in our 2016 election cycle. Civility: the virtue of being able to respect and be in community with your opponent, while still disagreeing. Civility: basic politeness, manners, the kind of stuff we were taught as kids: by our parents, our teachers, our elders. Wait your turn to speak. Watch your language. When you win, don’t gloat. When you lose, show grace and accept the results. Civility: the social glue that binds us together in community, especially when we live and work side by side with folks who do not share our beliefs. But this hope for civility: basic human decency in how we treat one another across the political and social divide? I don’t think I’ve ever seen it more absent than right now in our country and this conflict is embodied in the debates. Debates: politics as blood sport. Politics as Wrestlemania. Candidates wait to pounce. The audience gleefully hopes “the enemy” will make a gaffe or a goof or a mistake. The media, play by play announcers, analyzing not the weight of substantive policy, but the fluff of appearance, as if they are calling a beauty pageant. Did he roll his eyes again? Did she have that fake smile again? Who “won”? Who “lost”? Because here’s a basic truth about November 9th, the day after the election. That morning 45 percent or so of American voters (if current polls hold true) will be very disappointed because their candidate, cause, ideology, lost. Yet still we’ll all have to live together, going ahead. Figure out how to be America and Americans in community. Still we’ll have to face our mutual problems, regardless of ideology. Neighborhood crime and violence and poverty. A national opioid crisis. An economy leaving behind millions of our neighbors. Terrorism at home and abroad. A changing national demographic: some groups grow, some groups shrink. We can debate all we want, yell all we want, post our opinions on Facebook all we want about the rightness of our beliefs. Go for it. But then remember: we share a common home, all 319 million of us. A debate, a vote, does not change that reality. That’s why we need civility. As a person of faith I learned the central rule of civility from Jesus. Once when asked what the most important law was in his tradition, he simply answered, “Love your neighbor as yourself.” Pretty basic stuff. It appears in almost all faiths and philosophies. Treat “the other” as you wish to be treated. You don’t have to agree with them on everything. Your beliefs are not diminished when you honor the humanity of your opponent. There was a great photo that went viral on social media last week, a snapshot taken in Washington, D.C. at the dedication of the National Museum of African American History and Culture. 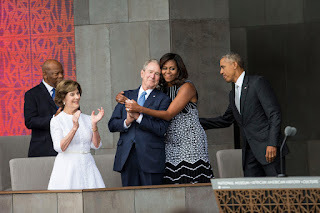 Pictured are two Presidential couples, the Bushes and the Obamas, natural enemies, right? Separated by race, politics, geography, life experience. Yet there they are, standing together, smiling. 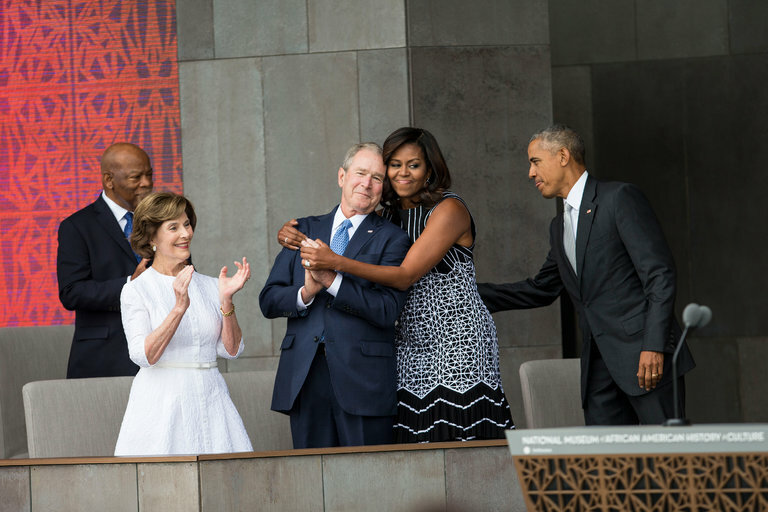 In the center is President Bush, a relaxed grin on his face, leaning back into Michelle Obama’s embrace. They looks like four old friends, sharing an inside joke. Will such rapprochement save the republic? No. But it teaches us that civility can work, if we choose to work it. One relationship at a time. To be civil: in all our interactions, political and personal. It pays off. On this I pray that there is no debate. Now back to “Star Trek”. One Ordinary Man. One Extraordinary Act of Heroism. Thanks Again Sully. What makes a hero, a hero…heroic? After a recent trip to my local theater to see the new Clint Eastwood directed movie “Sully”, starring Tom Hanks, I may just have to rethink my answer to that question. The film tells the story of “The Miracle on the Hudson”. On a frigid January morning in 2009, USAir Flight 1549, with 155 souls on board, was forced to make an emergency landing on the Hudson River in New York City. The aircraft was brought down by the most extraordinary of circumstances: a bird strike, resulting in both of the plane’s engines flaming out and stalling. In the 208 excruciating seconds after the accident (less than four minutes), Captain Chesley Sullenberger (“Sully”), and First Officer Jeffrey Skiles somehow safely brought the plane down for a water landing. The miracle, of course, is that all 155 passengers and crew walked away from that disaster, alive. Not one person lost. Not one major injury or casualty. Every one survived because two ordinary people did their jobs, acted extraordinarily, in a moment when any panic, any mistake, any slip up, any hesitation could have resulted in death for some, many, even most of the people on that plane. In watching the movie and remembering that story again, what most impressed me was how very ordinary Sully was: in how he is portrayed in the movie, and still is, in real life, almost eight years after that amazing day. Sully doesn’t look the part of hero, at least not like the heroes and heroines our culture so loves to lionize, idolize, and worship. He’s not a muscle bound athlete or an over coiffed pop singer. No: this hero is tall and thin and white haired, and sports a decidedly unfashionable eighties mustache. Sully could easily pass for an insurance salesman, or a bank manager, or the low key neighbor next door who lends you his lawnmower. His act of heroism isn’t the stuff of cliché drama either: no overheated swashbuckling exploits or over the top dramatic speeches to save the day. As the incident unfolds, with everything hanging in the balance, he’s cool and calm: giving orders in a steady voice, making multiple decisions, one right after the other, following procedure. After the plane splashes down, he wades through the plane’s interior as it slowly fills up with icy water, making sure that every last person is evacuated safely, no one left behind. Only then does he save himself. Strange how we as a world have come to think of our heroes, the ones who inevitably grab the headlines, fill up the twitter feeds, and dominate our cultural conversation. Now a hero is the politician who struts and blusters across the stage, clothed in the language of shameless self promotion, and all against a backdrop of red, white and blue. Or a hero is the sports icon who hits a ball or makes a touchdown and then flips his bat or spikes the ball to make sure that every one in the stadium knows just how awesome he is. We deify the business titan who makes hundreds of millions of dollars in the bare knuckled game called capitalism, the singer who tops the charts. But to me a hero is someone more like Sully. An everyday often anonymous person who summons the strength and courage and character to do the right thing when life demands it. Not for adulation or economic gain but because this is their job, their call. Like my friend who for more than twenty years has faithfully and lovingly cared for his spouse, who suffers from a chronic, debilitating disease. With grace and tenderness he cares for her, day in and day out. Or the neighbor I know who visits a nearby women’s prison every single week and tutors the inmates, helps them prepare for life on the outside. Her “pay” comes in the satisfaction of helping someone in need. Heroes like this actually abound in our world. We just have to look for them, beyond the spotlight, beyond the warped and weird ways we so often define heroism. Real heroes do the right thing because their faith in God compels them; because they could do no other; because they have decided to use their one God given life in the service of others and not just to serve themselves alone. Real heroes have a job and then just do their jobs. As Sully wrote in his autobiography “Highest Duty”, “Everyone's reputation is made on a daily basis. There are little incremental things - worthwhile efforts, moment you were helpful to others - and after a life time, they add up to something. You can feel as if you lived and it mattered." So here’s to the Sullys, the real heroes and heroines in our world. And who knows? Maybe you or I: we can be heroes too. Just What Does It Mean to Be a Patriot? Patriot (noun) 1. A person who loves, supports, and defends his or her country and its interests with devotion. It was the biggest American flag I have ever seen, a gargantuan flag, a sea of red, white and blue fabric. 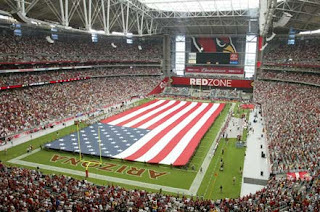 It covered the entire field in a 9/11 remembrance ceremony held before the New England Patriots football game this past Sunday evening in Arizona. How big was that symbol of America? Try 300 hundred feet long by 160 feet wide, so huge that it took more than a hundred people to unfurl and then hold it still, as Kristen Chenoweth, sang “The Star Spangled Banner”. As the music swelled and the 80,000 plus folks assembled there stood for the anthem, it made me wonder. Is that what it means to be patriotic and a patriot, to really love the nation you call home? Is one a patriot because you know all the words to a song and then sing it out loud at a sports game? Or if you take off your hat and stand up and then cheer loudly at the end? Earlier that day I was blessed to visit a little known but amazing private museum in Natick, Massachusetts, the Museum of World War II. It houses one of the largest collections of WWII memorabilia in the world. I spent two and half hours roaming through the halls of that place, saw some amazing and breathtaking items, all lovingly preserved, from the greatest social cataclysm of the last century. I touched a pair of binoculars salvaged from the USS Arizona, a ship which went down on December 7, 1941, when America was attacked at Pearl Harbor. It gave me pause, made me think about the men and women who died that day, trying their best to defend their homeland and protect their fellow citizens. Millions and millions of American soldiers and civilians and citizens all somehow came together in the war years, defeated fascism, defended freedom. Is that patriotism? To put one’s life on the line for others, in courage and in service? Earlier in the week I worked at the polls on our statewide Primary Day, checked local voters in. From 7 to 11 am I sat behind a table and crossed folks’ names off a voter list, then handed my neighbors a ballot. The turnout was low but next November 8th it will be a different story as our nation chooses a President. On that day and night, if past trends hold, more than 90 percent of my neighbors here in town will vote. Go into a private booth. Choose the man or woman who will guide our ship of state and have the power to wage war or to seek peace, to unite or divide us. All because we as citizens will give one of those candidates the power to do so. We vote because they work for us. Is that patriotism? To exercise this civic responsibility to choose our leaders? Lately our culture has been caught up in one of our periodic debates about just what it means to be a patriot and patriotic, sparked by the refusal of a professional athlete to stand during the playing of the national anthem at a football game. For a few days it was all the talk on social media and the airwaves. Some labeled him a traitor to his country for that act, declaring he is anything but a patriot. Others have defended the protest, declaring that his freedom to dissent is what makes a patriot, a patriot. But it begs the questions. What is patriotism? Who is a patriot? Who is not? And who gets to decide? Is patriotism about symbols and rituals? Like the flag I fly outside of my house. A lapel pin I sport on my suit. A red white and blue peace bumper sticker on my car. Watching fireworks on the 4th of July, and then cheering when the veterans march on by in a parade. When I rise at Fenway Park and sing along with 40,000 other folks that “our flag was still there.” Is that it? Can I claim the title of patriot if I do no more than cover myself in the appearance and trappings of patriotism? Or is patriotism about something more substantial, more concrete, more sacrificial even? Like serving in the military, or at the least, as a citizen, supporting those women and men who defend me. Thanking them. Making sure that when they come home they have all the services and resources they need to pick up their lives again. Paying my fair share of taxes: maybe that’s what a patriot does. Recognizes that part of our national covenant with and to one another is taking the fruits of what we’ve earned in freedom and then sharing it with those who have less or need a hand up or help. Is patriotism found in those who push back against the government, who protest in sincerity and non-violence? Maybe patriotism happens when we volunteer in our communities—build a Habitat for Humanity house, coach Little League, tutor an inner city kid, serve a meal at a homeless shelter. Is patriotism somehow connected to affirming the truth that we are all in this experiment called democracy together, and that we need each other. What does it mean to be patriotic and a patriot? So I’ll keep flying my American flag in gratitude, but for me, there has got to be more than just this, to being a patriot and to being patriotic. Is It Election Day Yet? PLEASE??!! Election? What election? 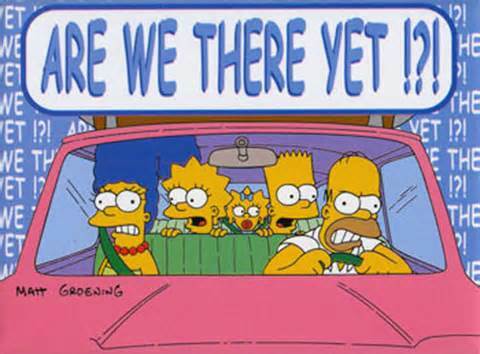 You mean there's a Presidential election going on? Really? Seriously? Why…I hadn't noticed. And so even as the summer begins to end and turns to autumn and we trust in this definitive seasonal conclusion; even as hot temperatures give way to cooler air and the weather will change, guaranteed; even as the Red Sox make their final push for the playoffs and we tearfully realize that David Ortiz will soon not be around for us to cheer him on any more…. Still: one truth, one reality, one stubbornly unstoppable force will not let up or go away soon or fade to black or just get the hint that enough is enough, already. It is this interminable Presidential election. I don’t know about you, but me? I am done with it. Done with the noisy daily coverage that dominates the culture. The blaring headlines in print. The scrolling stories on the web. The jousting social media news feeds that smugly declare “he is right and she is wrong” or “he is the devil and she is our savior”. I’m done with the way the election now seems to creep into far too many of my daily conversations. It’s not democracy I have a beef with. I usually love Presidential elections. This year as always I’ll be an election worker, checking in voters at the polls, helping folks cast a ballot. I’m an election baby, born on the November Tuesday in 1960 when Massachusetts own John F. Kennedy won the Presidential race. My folks were so excited by his victory that they gave me JFK’s name for posterity. These can determine the direction we will take as a nation for the next four years. The best elections engage us as citizens to do our civic duty, become informed and vote. Elections educate us about the issues of the day and introduce us to our potential leaders. Elections empower us to do the work of freedom. Unlike a Russia or a China, where free elections are a façade, in the United States elections actually reflect the hopes and dreams and desires of the electorate. But this election? It’s just too much for me now. It’s sucked all the air out of the room. It’s stifling. If the election were an illness, it would be of the zombie creating virus type. NOTHING CAN STOP IT! RUN FOR THE HILLS! If this election were a person, it would be that friend of yours who fails to get the social cue a discussion is actually over. You can go home now. If this election were a TV show, it might be “Law and Order”. Click around the channels long enough and you can always find an episode, 24/7. If this election were a Bible story, it would be the woeful tale of Moses and the Israelites wandering in the desert for 40 years. Are we there yet? Because some other things have actually been happening in the world other than “the Donald” and “Billary” taking pot shots at each other every day. A flood in Baton Rouge that destroyed 40,000 homes. Maybe we should pay more attention to and respond to this crisis. Or the awful war in Syria. Or the drought and unprecedented summer without rain we’ve faced here in the Bay State. Or the fact that on November 8th we’ll also be considering some other very important questions, like the legalization of marijuana. But you’d never know this by listening to the interminable gossip and “gotch'ya!” chatter of this election. The election that never ends. Yet there is some good news. It is t-minus a little over two months and counting until November 8th. On that great day we will finally be able to vote for someone and then put this far too often ugly, unending election behind us. Thank God. Until then? I plan on watching as many episodes of “Law and Order” as I can. At least with that show, I can always count on seeing two of the sweetest words in the English language.